It is something you must feel, deeply—this Presence, and this abiding sense that your life is really for something greater than what you have become accustomed to and what your culture promotes within you and you have come to believe. A Greater Coordination that has brought you into the world for a higher purpose, a greater coordination that you cannot define and you can never fully understand, for it extends far beyond this world into countless worlds in the universe. So great it is that no theology could contain it, no human understanding could grasp its expanse, its complexity and its perfect functionality. For you live two lives. You live a life in the mundane world that preoccupies you 99 percent of the time, and you live as part of this Greater Coordination, which you may glimpse for moments here and there—moments of clarity, perhaps even moments of great sobriety, where you reconsider your life from a more objective perspective. But the Coordination lives within you at a deeper level, beneath the surface of your mind, beneath your social mind, your worldly mind that has been so conditioned and shaped by your experiences in the world and by the decisions and conclusions you have made for yourself. Deep within you there is a sacred Mind—a Mind created by God, a Mind We call Knowledge, a Mind that is connected already to the Great Coordination. For Knowledge represents your connection to God, but it also represents your purpose for being here, a purpose you have not invented for yourself, a purpose that you do not yet understand. Even if you have a very spiritually oriented understanding, it is something greater than this. For Knowledge represents the part of you that is eternal, but it is here on a mission, you see. It has a greater purpose for being in the world, which represents your greater purpose. Beyond all your goals and plans, or what you think life requires of you, this greater purpose, this Greater Coordination, lives within you. While you seek union in relationships, so hopelessly; while you seek to fulfill yourself in the world, so hopelessly; while you seek to meet the deeper need of your soul by acquiring things, people, places, possessions, everything, or keeping yourself stimulated at all times, what will really satisfy you and fulfill you and return you to your true relationships in the universe is the Greater Coordination itself. It will always be mysterious, for you can only grasp your small part of it and how it might relate to certain important people you may be fortunate enough to meet in your journey here on Earth. God is working throughout the universe to reclaim the separated, for all sentient beings living in the physical reality are living in Separation from their eternal home and union with God. Everyone has come into this reality seeking to have a different experience, seeking to individualize themselves completely and give themselves form, and live in a reality where there is very little evidence of their true nature, their true home, their true origin or their true destiny. An expanding universe of ever-changing events—chaotic it is, unpredictable, difficult, challenging, dangerous, yet beautiful and promising and important if you can grasp it from a greater perspective, from the Greater Coordination. God works through the Higher Powers in the universe, which represent the Angelic Assemblies that attend all worlds where sentient life has either originated or has colonized…the Higher Powers, existing beyond the visible range but ever watchful, ever attentive to those who remain below. You cannot comprehend what this means yet, for you are dominated by your senses and by this temporary reality that you live in. 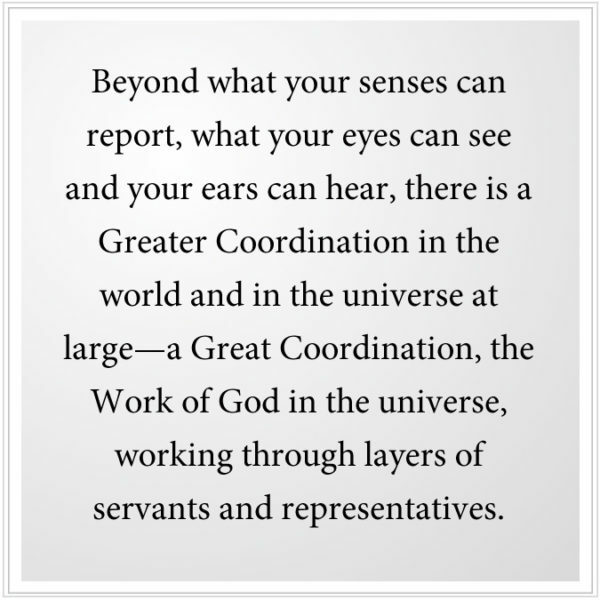 But the Greater Coordination is in you and all around you. The Higher Powers are directing those individuals who at the highest levels represent the Networks of the Wise: unique individuals in small groups, operating usually in secrecy in the Greater Community, for there are very few free worlds that would accept them and support them—the Networks of the Wise, who respond to a greater directive from above, directing their activities, their skills, superseding their human nature or the nature of whoever they are in the universe. They have their supporters and their assistants, who protect them, who guard them, who carry out their directives in the world, who support their activities. There are many of these, particularly in your world where there is still sufficient freedom for the Network of the Wise to function in greater openness, greater freedom, in many places here. It is a perfect Plan, but it must function in a changing and unpredictable reality, ever adapting itself to changing circumstances, unexpected events, for the Wise in any world cannot foresee everything nor understand the meaning of all things. The Higher Powers need this Network of the Wise as their representatives down here on the ground. The Higher Powers must oversee many greater things and cannot be involved in the details of daily life. Therefore, do not think they attend to you personally as if they are your personal assistants or attendants, for this is hardly the case. You may be visited periodically to restrain you from harming yourself or giving your life away to something that has no purpose, meaning or success. But do not think the Angelic Presence stands by you at all times, for this is hardly the case. For God has put Knowledge within you to guide you. It is part of the Greater Coordination. God does not have to run your life. God does not have to run the world. For all of the biological and geological forces were set in motion at the beginning of time, everywhere. It is all running itself now, so do not think that God is creating the calamities or the events of your day. That is a foolish, ignorant error and will only lead you into greater confusion and misunderstanding. It is God’s Plan to keep Knowledge alive in this world in enough individuals to guide humanity through the dangerous events to come—through the great decline of your world, through your contact and dangerous encounter with forces from the universe who are here to take advantage of humanity. God’s Plan is to ignite Knowledge in enough people here in the world through God’s New Revelation for the world, to steer humanity in a positive direction and to keep Knowledge alive here—a light that has gone out in so many places in the universe, so many technological races that have lost the gift of Revelation. Their only hope now is that the Network of the Wise may exist within them, deep in secrecy, functioning under very difficult and dangerous circumstances. For such great power and freedom is feared by governments even within your own world, and especially in the Greater Community, where there is very little personal freedom and where the Power of Heaven is either forgotten or is greatly feared. 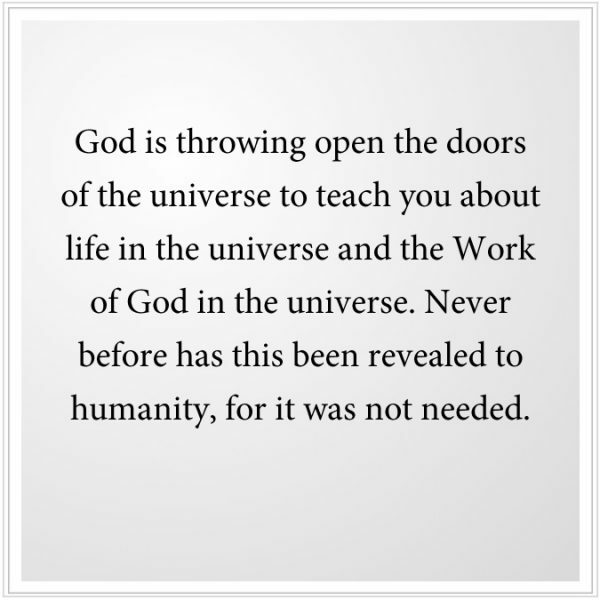 It is an education you are only now beginning to have because God is throwing open the doors of the universe to teach you about life in the universe and the Work of God in the universe. Never before has this been revealed to humanity, for it was not needed. But it is needed now greatly as you stand at the threshold of this Greater Community of life, and as your world declines and you are facing the greatest threshold that humanity has ever faced, or might ever face, at this great turning point in your evolution. It is a time of great promise for a promising race, but there are many hazards and many dangers here, and many errors that people are making and will make that could destroy the great opportunity for humanity, which is still alive in your world. You are preoccupied with yourselves, with your needs, your issues, your fears, your desires, your predicaments. And this keeps you from experiencing the power of the Greater Coordination within your life. And indeed you cannot simply believe it is going to take care of everything for you as if you are a witless person who must be directed in all things, for this will hardly be the case. You must become strong and determined, competent and responsible in all things, or the Greater Coordination will remain in the background, and your haphazard life will continue regardless of your beliefs and assumptions. What We are presenting here today requires a great preparation to comprehend and to experience authentically and consistently. And that is why through God’s Revelation for the world, the Steps to Knowledge have been given, the ancient preparation in the restoration of individuals and in the hope for races everywhere. It is a miracle of untold significance that you have such a preparation now. Do not think you can prepare yourself. Do not think you are ready. Oh, my goodness. Do not think that your ideas and beliefs are sufficient for your greater needs and for your ability to navigate the great change that is coming to the world. Do not think your faith in the Divine is sufficient if you will not prepare, if you will not take these Steps to Knowledge, if you will not reform your life and allow it to be shaped by the Great Coordination that lives within you. This is the Revelation that you have been waiting for, but you are uncertain if you are willing to take it on, to accept its challenge and its gift and its promise. This is your ambivalence, which weakens you and keeps you from clearly seeing the path you must follow and the work you must do and the decisions you must make. This is the challenge for all who can receive something of this magnitude. Heaven knows what this means. Heaven knows how important this is. Heaven knows the difficulties that stand in people’s way. It is the ambivalence about rejoining reality, the ambivalence about returning to the Great Coordination, of which you are intrinsically a part, regardless of your religious ideas and beliefs. Even if you are opposed to religion, even if you are committed to a secular life, you have not changed anything regarding your true nature, circumstances or calling. Your position only either strengthens you or weakens you in your ability to respond. You cannot change what God has set forth for you. The gift before you now is the Gift, but it confronts you with your own ambivalence, your fear, your uncertainty, your grievances, your unforgiveness, your contempt for others and possibly your contempt for yourself. All these things must be cleared away as you proceed. And God has given you the Power of Revelation to enable you to do this, for on your own you could not do this. The Great Coordination, which extends far beyond this world, far beyond this galaxy and to other galaxies, reaches all the way down inside of you to the most sacred and essential part of you. You are already wired into this great assistance, you see. It was created by God. It is overseen by the Higher Powers. It is carried out through the Networks of the Wise and all of their many assistants and supporters, in ways that are so great, so varied and so manifest, you could not account for it all. Even within your local environment, even within your town or city, you could not account for all of the work of the Great Coordination. You cannot yet even account for it within yourself, for you are just beginning that journey. Do not worry about Hell and damnation, for that is a human invention. God will rescue you in time, but time is your problem, you see, for you do not have a lot of it. And you are beset with many things that are inappropriate for you, that are harming you and holding you back. Perhaps you have given your life to people and circumstances that do not represent your true destiny here. And now you must face the fact that this must be unraveled to a certain extent so that you may be free enough to follow that which you must follow within yourself—the deeper Knowledge that is here to guide you in all things. But you must do the work to open the way, to take the Steps, to engage with this greater process of reclamation within yourself. You do this for yourself most certainly, but you do it for others and for those you are meant to serve in this life, which accounts for more relationships than you can understand at this moment. You are not called to be a great person here but only to carry out your simple and essential service. Do not assign roles to yourself in this way. Allow your life to open. Take the Steps to Knowledge, patiently, for the things you must learn along the way are the essential wisdom that you must have, the essential strength you must have, the essential discernment and discretion you must have, which can only be created by taking a journey of this magnitude and importance. Do not think the Greater Coordination is running everything, for there is much chaos in the world. There is much danger and misery in the world. There is much destruction being carried out in the world because so many people live without this Knowledge. And so many people follow them. This is the great network of the foolish, the ignorant and the destructive. Do not think the world is as it is because the Great Coordination has fashioned it in this way, for it is truly in a dangerous and self-destructive pattern of events—destroying its climate; destroying its resources; contaminating its food, its water, its soils; engaged in constant conflict, competition and war. The Greater Coordination must work in spite of all of these things, you see. Do not be lazy and just think that everything is being done for you or being managed by greater powers. You must become far more responsible and engaged than this. You cannot merely be a passenger on this ship. You must be part of the crew that is engaged in rescuing human civilization from self-destruction, a path it is most surely on at this moment. We, therefore, bring you great truth, great encouragement, great promise. But with this We bring great sobriety, great correction, great clarification. For without Knowledge, people will be in error and will continue to be in error and live a haphazard and destructive life—unfulfilling at least and destructive at the worst. That is why God is not going to condemn anyone because God knows without Knowledge to guide you, you will live a haphazard life full of error and misfortune. You will be subject to all the forces in the world. You will be shaped by your culture, your family and your religions in such a way that your chance of ever discovering your real nature will be extremely limited. The Great Coordination is something you must prepare for. Do not think by having grand ideas or egalitarian views that you can understand this or appreciate it or experience it with any potency. This is not the realm of ideas and belief that We speak of here today. This is a realm of true relationship of higher purpose working through your life, working throughout the universe. Here you might even have to give up your spiritual ideas because they are merely clouding your vision, or obstructing your view, or giving you fanciful notions that have nothing to do with reality—used to comfort yourself, used to give you a sense of security because you really are insecure. No, you must face your condition very squarely, very objectively, very honestly to see the need for Knowledge within your life. It is a great reckoning. Living with layers of fanciful assumptions will only hold you back and give you a false sense of meaning and security here. Here your suffering can serve you if you can face it honestly, without self-condemnation. Here it brings you to your need for God, your need for Knowledge, your need for purpose and real meaning in life, your need for a Greater Coordination. Heaven is waiting for you to reach out—honestly, deeply. You must send the sign to the Higher Powers that you are ready to have your true life restored, to begin to return to your fundamental relationship with your Source and with the Power of Heaven as it is working within people and through people and throughout the universe. You may pray for little things: for needs, for comforts, for resolution to problems. But We are speaking of something much more important here. Heaven will allow you to live your haphazard life regardless of your opinions, your views, or your assumptions. For you are free to do this. But Heaven is waiting for you to reach the point of great sobriety where you realize that you are not really living the life you were meant to live, that all you have built around you really is not that important, that there is something greater within you that must emerge—a great turning point in your life where you can begin the return to your true relationships and true purpose for being here. Heaven is waiting for you to reach this point, and your suffering will help you find it if you can really be honest about this. The Great Coordination is at work everywhere—in some places to a greater extent, in others to a lesser extent, depending on the circumstances of those worlds and situations, the degree of freedom or lack of it that exists there, and how many can be prepared for a greater level of service: both amongst those chosen to be the Wise and all those who can assist them in specific and particular ways. The prayer for you is: Let me be of service so that I may give. For in the end, it is all about simple service. No matter how difficult the journey, no matter how great the mountain is you must walk up, in the end it is all to assume a role that is yours to assume and to play your small but essential part in this Greater Coordination. Here there are no superstars. Forget all that. Here there are no saviors and avatars and masters. Forget all that. In the Great Coordination, this does not matter. There are no heroes to worship. There is only the great Calling going out into the world, especially at this time in planet Earth because God’s New Revelation is here. It is so rare in the universe that a great Revelation can be given to a whole world, for most worlds do not have the freedom to allow anything like that to happen. Likewise, give up the notion that there are enlightened races in the universe. That is really not true. There are groups of the Wise in the network, but these are not whole races. Within Separation, that goal really cannot be achieved, except under very rare circumstances. Never think that an enlightened race is going to come to Earth to help humanity, for that is a total deception and confusion. God’s New Revelation for the world will prepare you for the reality of life in the universe and for the spirituality of life in the universe, which represents your true spirituality, free of human assumptions, ideas and beliefs. For God’s Work is not for this one world alone, but in concert with God’s Work everywhere. 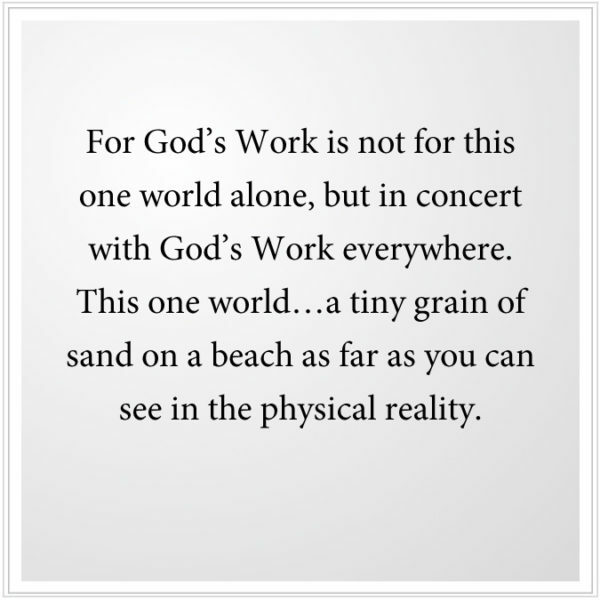 This one world…a tiny grain of sand on a beach as far as you can see in the physical reality. But God is aware of your world. The greater Network of the Wise and the Higher Powers are at work everywhere in ways far beyond human understanding or the understanding of any race in the universe. Hear Our words. Listen to them again and again. Comprehension will come in time with repetition. Think not you understand what We are saying. Do not agree with it or dismiss it based upon your personal viewpoint, for that is being stubborn and foolish. Your heart will know if you can follow this. Deeper within you, there are greater powers and forces at work. This is what you must discover. This is the great challenge and meaning of your life. We invite your comments and discussion.